Torrance, California-based Spinifex Group staged the entire event, created the media and opened the proceedings with an immersive VR experience of their own devising that provided a dynamic look back at the singer’s biggest hits. Fans at the Troubadour in Los Angeles and a venue in London watched a live stream of the Gotham Hall event while thousands more tuned in on YouTube. WorldStage was tasked with providing video projection mapping for Gotham Hall, a neo-classical building dating from the 1920s that once housed the Greenwich Savings Bank and now serves as an event space in midtown Manhattan. The oval-shaped interior is a clear span with a coffered dome ceiling with a skylight at its apex. 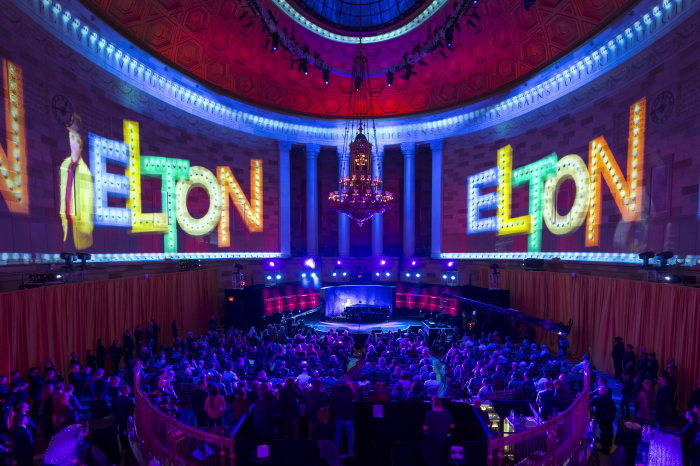 WorldStage used Christie Boxer 4K30 projectors to accomplish the feat. The 30,000 lumen, 3DLP projectors with 4K resolution were fed by disguise 4x4pro media servers. At WorldStage Peter Smith and Carson Polan-Volpe were the Project Managers, Michael Kohler and Patrick Angle the disguise programmers, and Denis Alfonso and Juan Mateo the Projectionists.